It wasn’t easy, but we did it! At MacroLife Naturals Inc., we are dedicated to bringing the unique tastes and proven health benefits of nature’s amazing fruits to you. Miracle Reds is more than a fruit blend; it is an advanced, non-allergenic, proprietary blend of nutrient-rich, anti-aging anti-oxidants, polyphenols and heart-friendly plant sterols. All ingredients that make up Miracle Reds are natural, organic, vegan, gluten free and raw. There are also no GMO products used in any MacroLife Naturals product. The formulas were meticulously created and tested for optimum health enhancement. 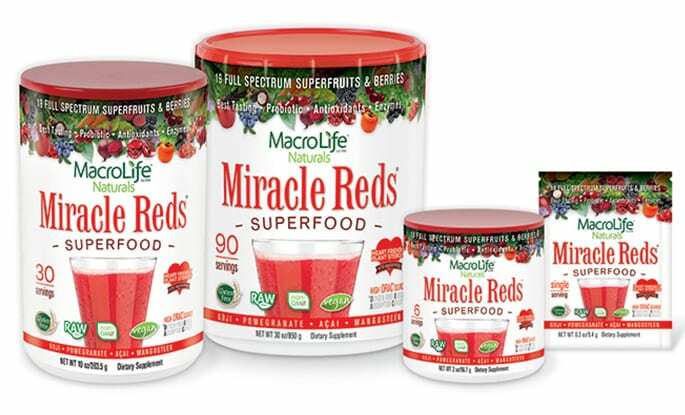 Miracle Reds superfood supplement is much more than a fruit blend! It’s an advanced, non-allergenic, proprietary fruit blend. Miracle Reds has nutrient-rich, anti-aging anti-oxidants, polyphenols and heart-friendly plant sterols. Delicious and nutritious, great for anytime – perfect for post workout recovery! Doctor Formulated: Miracle Reds Organic SuperFood is Rich in Vital Vitamins, Minerals and Polyphenols – Non GMO, Vegan, Gluten and Dairy Free. It’s an Organic super food supplement with probiotics: Miracle Reds Superfood fruit & veggie drinks powder with ingredient list of vital digestive enzymes, polyphenols, vitamins & minerals for all day energy. Miracle Reds – Ingredients: created with blueberries, boysenberries, elderberries, blackberries, and red raspberries. All these delicious berries combine to form a nutritional powerhouse. Packed with antioxidants proven to help mop-up unstable free radicals that damage cells. All ingredients are high in polyphenols, carotenes, and phytonutrient antioxidants – compounds sorely missing in typical diets. Here’s a list of some of the Miracle Reds – Ingredients, and why they’re included. The entire nutritional/supplement facts table follows. 50 times more potent than Vitamin E, and 20 times that of Vitamin C. Strengthens connective tissue, and improves elasticity of the skin by stabilizing collagen and elastin. Provides Xanthones, which are some of the most powerful antioxidants found in nature. The synergistic effect has a remarkable effect on supporting the heart and cardiovascular system. These important compounds contain antibacterial, antiseptic and fungicidal properties and aid in reducing inflammation, pain and fever. Oat Beta-Glucan is a biologically active soluble fiber that helps lower blood cholesterol and balances glucose and insulin levels. Turmeric acts as an anti-inflammatory antioxidant with valuable compounds that help ease inflammation, pain, and improve circulation. Contains 1 billion non-dairy “friendly bacteria” per serving, which helps with the digestion of foods and also with the absorption of vitamins and minerals. What are the white speckles that appear when Macro Greens and Miracle Reds settles in my glass? Don’t be alarmed by the layers of rainbow color, they represent the colors of nature. Settling in a glass will naturally bring out these colors. The white speckles are Vitamin E, Lecithin, and or plant sterols that are slightly less water-soluble than the rest of the ingredients. Don’t worry, simply stir and enjoy! The liquid turns a faint red due to the colorful nature of the Beet Juice powder and Raspberry Juice powder. Settling will bring out these colors of nature. Should I use other vitamin supplements with Macro Greens or Miracle Reds superfoods? Our Super-Foods are foundational formulas providing most of the vitamins, minerals, and antioxidants you need for the day, just like the once a day multi vitamin formulas. However, if you feel that your body needs more of some of the vitamins or minerals than is contained in Macro Greens or Miracle Reds, we suggest you continue taking that/those supplement(s) every other day or half the amount per day along with a well balanced diet. What about mixing dairy products with Macro Greens or Miracle Reds? I noticed a few of the Macro Green and Miracle Reds recipes suggest using yogurt or milk. Does consuming dairy products with Macro Greens inhibit the proper absorption of the product? I ask because so many supplements specifically say NOT to take with dairy products. Mixing any MacroLife product with dairy does not inhibit the absorption of the vitamins or minerals at all. You can add any MacroLife powder into anything but very hot (boiling) liquid or very acidic juices. We suggest that you mix all MacroLife powders with soy, almond or rice milk for a great tasting alternative to juice or water. In addition, Miracle Reds does not contain: MSG, preservatives, artificial flavoring, wheat, gluten, corn, yeast, egg, salt, kelp, casein, dairy or animal products. How much fiber does Macro Greens and Miracle Reds contain? Macro Greens contains 2 grams of fiber per serving and Miracle Reds contains 1 gram of fiber per serving. Can I mix Miracle Reds and Macro Greens together? Many customers ask us if it’s okay to combine Miracle Reds and Macro Greens or drink them together. If you are taking both Macro Greens and Miracle Reds, try having a glass of either Macro Greens or Miracle Reds as part of your breakfast and the other as a convenient, stimulant-free afternoon energy boost. As part of a balanced, low-glycemic, alkalizing diet, drinking Macro Greens and Miracle Reds throughout the day will help you experience greater mental acuity and regulated energy levels which, in turn, will help you make better food choices if you are trying to lose weight. Another alternative serving suggestion is to mix a small amount of Macro Greens or Miracle Reds powder in a large water bottle, fill with water, add a splash of apple juice, to taste and drink throughout the day! Drinking a dilution like this will ensure that your body receives a continual influx of the vitamins, minerals and nutrients contained in Macro Greens and Miracle Reds. I’ve been buying the same product for years, why does the product taste different sometimes? All MacroLife products are mixtures of happy organic fruits, berries, and plant extracts that are never synthetic! This is why the taste may change depending on harvesting season, but the ingredients remain in the same amounts. Miracle Reds tastes great but why do you add sugar? Miracle REDS is a berry based anti-oxidant formula and therefore contains naturally occurring sugars from the berries and super fruits contained in the product. But we assure you that we do not add any sugar. If you have insulin issues do not use any juice and only mix into water. We think you will find the drink to be especially tasty since it is naturally sweet. Does Miracle Reds help with inflammation? Normally, inflammation is part of a healthy immune response that heals injury and fight infection but chronic inflammation is very different. Cancer, diabetes, depression, heart disease, stroke, Alzheimer’s—these seemingly diverse diseases–are increasingly thought to have inflammation as a common denominator. And the concerns around cholesterol and cardiovascular health also center on inflammation. LDL cholesterol, the type of cholesterol that can clog your arteries, is most seriously an issue when the arteries are inflamed. A marker for inflammation is the compound C-reactive protein (CRP) that can be measured through blood tests. Assessing CRP levels is currently recommended for those at increased risk of heart disease. High levels of CRP are associated with future heart attacks and strokes. Miracle REDS contains heart healthy Plant Sterols, Oat Beta Glucan, Turmeric, ….which help reduce inflammation in the body. What is the ORAC score of Miracle Reds?